As a young political science major, Greg Kotis once contemplated giving up theater. “I got a sense that a life in the arts would be one full of folly and doom and sort of destitution. My hope coming to the University was that I would rid myself of that childish desire. I would put it aside and become a serious person and have a real degree and get a real job,” he explains. Instead, Kotis ended up center-stage on Broadway as the winner of three Tony Awards for the hit show Urinetown: The Musical, which he co-created with fellow alum Mark Hollmann. “At some point, I just sort of admitted that I like doing this too much,” says Kotis. 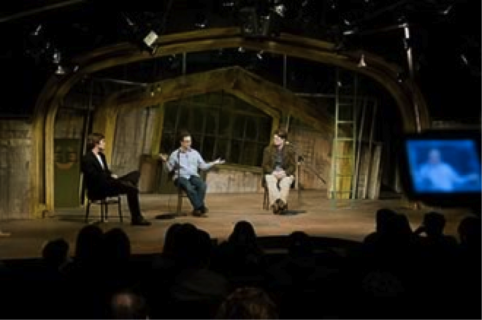 Kotis, AB’88, and fellow alum Mark Hollmann, AB’85, came to the University in March to meet with students in the Theater and Performance Studies program and to see their production of the musical. When they created Urinetown, Kotis and Hollmann challenged theater convention by drawing on their interests while at the University, and the improvisational skills they honed at Jimmy’s Woodlawn Tap. With its toilet-centric setting, a plot where the downtrodden do not triumph, a score with allusions to everything from Kurt Weill to Marc Blitzstein’s The Cradle will Rock, the quirky Urinetown was a smash hit, earning three Tony Awards in 2002. The witty musical has been performed from Broadway to London to Tokyo. For 10 days in March, it was the University’s Theatre and Performance Studies’ main stage production. Hollmann and Kotis spoke with students before attending the show. Among their advice: Embrace your inner egghead, and don’t be afraid to make it up as you go along. “What we had, and what you have, was this goofy, off-beat, reference-level mind,” Kotis says. “Urinetown exists because we’re products of this school. There’s a special thing in the water here…something we can bring to our material that someone from a conservatory or a strict theater writing program can’t bring. The idea for Urinetown came to Kotis in 1995 following a European tour with the Neo-Futurists, a theater group based on the city’s North Side. Nearly broke, he struggled to justify using Paris’ pay toilets, and began envisioning a world in which private toilets are banned. Later that year, when Kotis moved to New York, he reconnected with Hollmann, whom he first met through the Cardiff Giant Theater Company, a Chicago improv group. Hollmann was working as a word processor while moonlighting as an organist for a Lutheran church. “With nothing better to do,” the duo went to work on the script and score, with the grand sanctuary of Hollmann’s church providing a perfect rehearsal space. Kotis loves the unpredictable nature of theater. “I think half the time you’re convinced the worst is coming, and half the time the best is coming. When Urinetown struggled to make it to the stage, Hollmann and Kotis decided to produce it. The first show to open on Broadway after Sept. 11, Urinetown eventually earned Tony Awards for best score, best book, and best direction for a musical. One of the goals of the program is to engage students with professional dramatists. During recent months, Chicago graduates from Scott Sherman, AB’04, who helped write the sketch show, “Important Things with Demetri Martin” to Bernie Sahlins, AB’43, co-founder of Second City, have met with students. Fourth-year Augie Praley, who played Caldwell B. Cladwell in the TAPS production, says Kotis’ description of the writing process—like getting a couch up a flight of stairs—resonated with him, as did his experience as a first-generation player in the improv group Off-Off Campus.